The same food can be cooked a hundred different ways. Take chicken, for example: grilled, baked, broiled, fried, stewed, battered & fried, sauté'd, the list goes on. The purpose of this note is to understand exactly what happens when you overcook or cook food at too high of a temperature. The warnings came out a few years back about fried starch and chargrilled meats as being carcinogenic, but the story does not end there. Advanced Glycation End Products, or AGE's for short, have become the focus of many scientists and how overcooking food directly leads to reactions in the body that age us quicker and lead to many of the inflammatory diseases we now face. It's not that primal man ate everything raw, he didn't. 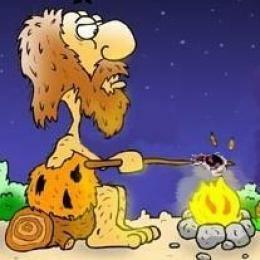 Fires were part of the culture and meat was certainly cooked over them. Slow cookers, gas grills, and sushi bars were not around either but certainly raw meat was eaten frequently. No joke, right? Once again, serious consequences not only from scalding food, but eating too many foods that have sugar in them or are readily converted to glucose, such as wheat and grains. When a food is cooked at a high temperature and burned, scalded, caramelized or fried, it changes it's structure. The interaction of proteins, fats, and carbohydrates become progressively altered as heat temperature and cooking time increases. Take meat for example. The chargrilled marking lines are an indication of excessive heat, so is the browning on donuts, or eggs that have been over cooked and brown. Cooking at temperatures over 250°F (which really isn't that high) greatly accelerate these reactions. The takeaway? Don't eat foods that are grilled and fried too often. Incorporate stews, the use of a slow cooker, and some aw food more than often. Excess glucose swimming around the bloodstream, due to over consumption of Carbs, causes the formation of reactive oxygen species which interact with AGE's causing conditions, disease, and even DNA damage. Excessive Glucose is found due to the massive consumption of grains, fruit, soda, dairy, and the many other foods most people eat in a Western Diet. Bread, French fries, donuts, and soda are causing deep cellular damage that are barely noticeable and often tossed off as 'normal' by products of aging...and prescription drug use. "Endogenous glycations occur mainly in the bloodstream to a small proportion of the absorbed simple sugars: glucose, fructose, and galactose. It appears that fructose and galactose have approximately ten times the glycation activity of glucose, the primary body fuel." "Foods with significant browning, caramelization, or directly added preformed AGEs can be exceptionally high in these pro-inflammatory and disease-initiating compounds. A very partial listing of foods with very high exogenous AGE's includes donuts, barbecued meats, cake, and dark colored soda pop." The list is long and includes age related conditions and diseases as simple as wrinkles or acne, but more serious conditions develop the longer and more often excessive carbohydrate and over-cooked, over-processed foods are eaten. Cancer, Eye/Retinal cell deterioration, Deafness, Neuropathy, Alzheimer's, Cardiovascular Disease, Pancreatic cell destruction, Kidney disorders, and Diabetes all begin with inflammatory reactions in cells. - DNA may accumulate substantial damage over time. - Beta cells in the pancreas, (the ones that produce Insulin), are also at high risk of damage. - Damage by glycation results in stiffening of the collagen in the blood vessel walls, leading to high blood pressure, especially in diabetes. - Glycations also cause weakening of the collagen in the blood vessel walls which may lead to micro- or macro-aneurysms; this may cause strokes if in the brain. - Significantly reduce cooking by using methods like moist heat, shorter cooking times, cooking at lower temperatures, and using acidic ingredients such as lemon juice or vinegar. - Incorporate raw foods a few times a day. - Eliminate grains like corn, oats, rice, barley. - Eliminate legumes like beans, soy, peanuts. - Realize pseudo- grains like quinoa, aramanth, are not miracle substitutes. - Avoid foods with AGE's already in them such as deli meats, soda pop, BBQ, and heavily processed and pre-prepared foods.
" Sugars have a nasty habit of reacting with proteins in our bodies. These complexes become oxidized and for Advanced Glycation End Products. They damage proteins, enzymes, DNA, and hormonal receptor sites on the surface of our cells. AGE's are a major cause of the symptoms we take to be normal aging." "While some AGE's enter the body directly because they are found in various foods, they are also a by-product of high blood sugar (glucose) the phenomenon that defines diabetes."